NEW YORK (AdAge.com) -- The subprime-mortgage meltdown may be riling financial markets, but it's not getting consumers to squeeze their wallets shut. Even without home equity to spend against and with mortgage rates soaring, John Q. Public still has his credit cards to ring registers and, of course, pile on dangerous amounts of debt. Robert Manning, consumer advocate and author of 'Credit Card Nation,' says banks won't cut back on credit card lending because it helps make up for shortfalls in their mortgage divisions. The long-running crisis has caused a chain reaction of financial misery through a swath of financial institutions that invested heavily in securities composed of pools of these risky mortgages, putting icons such as Bear Stearns, Goldman Sachs, BNP Paribas and a large handful of hedge funds in a heap of trouble. Less clear is whether the fallout will lead to a broad pullback in the consumer spending that accounts for nearly 70% of gross domestic product. Early indicators give off a slew of mixed messages. Perhaps the only certainty is that folks are coping with the housing-market-induced woes by continuing to lean heavily on those wallet-size plastic crutches. Despite proclamations of the death of easy credit, there's no indication the crunch will lead banks to cap that gusher of credit-card debt that helps fuel so much of American growth. Sure, interest rates on mortgages are rising, and it's gotten tougher for homeowners to borrow against their homes, but there's little to no incentive for lenders to pare available card balances because of a simple reality: Most credit-card issuers are units of big, full-service financial centers that include divisions being beaten up by the housing bust and its impact on the stock market. The card business is one way for banks to heal themselves. "The banks would be loath to cut back, except for maybe the riskiest of customers," said Robert Manning, consumer advocate and author of "Credit Card Nation." "They need to make up for the problems in their mortgage divisions somewhere." There is some subprime exposure in cards, too, but it's softened by mounting evidence that consumers won't be letting their Visas and MasterCards go during tough financial times. Credit-card delinquencies have stayed flat throughout the housing-market crisis. And big-bank executives probably thought they were getting an early Christmas gift in the form of a June study from credit-reporting agency Experian, which found that people with bad credit are less likely to skip a card payment than a mortgage payment, largely because they need credit cards to buy everyday items. Overall, a few indicators suggest consumers have been decreasing their spending. The Department of Commerce reported June spending was up only 0.1%, down from 0.6% in May; it was the smallest increase since September 2006. Most retailers missed July expectations, according to Retail Metrics, suggesting tough times ahead. Any consumer resilience is dependent on credit debt. Research from the Gallup Organization and Experian found that half of consumers would be uncomfortable making a major purchase such as a car or home in the next three months, and almost 90% don't plan to apply for credit during that period. 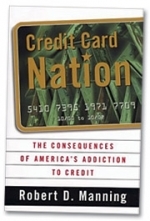 Yet the Gallup-Experian personal-credit index -- which measures individuals' satisfaction with their credit situations by looking at issues such as monthly payment burdens and levels of debt -- rose eight points between June and July, suggesting an improbable improvement in the collective comfort level about debt. American consumers racked up $13.2 billion in debt in June, according to the Federal Reserve, just about doubling economists' expectations. May gave us an even bigger increase of nearly $16 billion -- the biggest spike since last November. All told, there's a well-founded state of anxiety about credit markets among consumers that their behavior hasn't caught up with. That disconnect might help the economy in the short term while causing the indebted more pain in the long term, including ballooning late fees and finance charges and even more foreclosures and bankruptcies, Mr. Manning said. "This is unchartered, perilous territory." This story ran on AdAge.com on August 13, 2007.